A large number of people in the Himalayan region, particularly in remote areas, depend on a variety of plants. In far-flung rural settlements, where vegetable cultivation is not practised and market supplies are not organized, local inhabitants depend on indigenous vegetables, both cultivated in kitchen gardens and growing wild. Among them is lingra (Diplazium esculentum). Lingra fronds grow in all moist, humus rich places under forest canopy and even on roadsides at altitudes ranging from 1,900m-2900m above sea level; they are also easily found in Dehradun, Shimla, Gangtok and other state level markets of hill states. 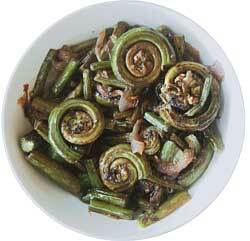 The fern is an essential part of cuisine in the Himalayan region, especially from March to July. The fronds are collected by women when they go to the forests to collect fuelwood and fodder. Sometimes they are dried and stored. People in urban areas grow lingra in their kitchen gardens (in hill culture kitchen gardens are a must have for every house). Lingra has 86 per cent water content, 8 per cent carbohydrate and nearly 4 per cent protein content. The shoots and fronds of Diplazium esculentum have an iron content of 0.56 per cent. A comparison of the mineral contents of these wild edible species with commercial vegetable species has revealed that lingra has much higher calcium content. The fronds are reported to cure epilepsy, urinary diseases, stings and bites, rheumatism, leprosy. Lingra is also used as a remedy against constipation and as a general health tonic. It's not just food. It serves other functional purposes as well in everyday life. When there are heavy rains in the hills and lopping off of trees for fodder and cattle bedding (to keep warm) is not possible, inhabitants of Kedarnath Valley and other moist valleys of Uttarakhand use the mature fronds for the purpose and later produce manure by mixing them with cow dung.